This is a complete BestValueVac® vacuum chamber setup designed built and 100% tested in Naperville, Illinois. Pyrex chambers have a glass body to the chamber, giving a better view of the inside. With our unique patent pending gasket design (Utility Patent #14/533,548) this chamber is sure to last 10,000 uses with proper care and maintenance. The gasket itself is reversible (doubling the life of our system) allowing customers to instantly take it off and flip it over. No adhesives are used! Our simple gasket design even allows you to place the lid on the chamber somewhat off center and still pull a full vacuum. This is a feature that most other vacuum chambers do not offer. The maximum allowed temperature of this chamber is 160f. The components of this chamber are rated at higher temperatures however as a vacuum vessel we limit maximum operational temperature to 160f. Every chamber is tested prior to shipping to lose no more than 2.5Hg/24hrs. 5' of vacuum rated HVAC hose to pull a vacuum. • BestValueVac® Chambers are not compatible with stabilization resin (i.e. Cactus Juice™, Gator Venom™, Minwax™ etc. ), alcohol, ethanol, acetone and acrylic based monomers or polymers.The lid may only be cleaned with soapy water. • GlassVac® chambers are compatible with all solvents and stabilization resins. We only recommend and warranty GlassVac® chambers for resin infusion and wood stabilization.The lid may be cleaned with any solvent or cleaning agent. See FAQ at the top for product safety warnings. •If the consumer is using the pump for prolonged periods of time exceeding 5 minutes we require that a cold trap is used or the pump warranty is void. •These stabilization resins have the ability to break down the internal components of the pump that are plastic resulting in a seized motor voiding all warranties. •To prevent these issues from happening to your process, change the Oil after each vacuum pump use, Even if the use time is only 5min. The Best Value Vacs VE Series rotary vane vacuum pumps are known for their high degree of efficiency and deep ultimate vacuum, utilizing a reservoir of oil to maintain a high vacuum seal within the ultra precision-machined pump internals. Designed for long-term use and low maintenance, our VE series pump offers the best value in an economy vacuum pump available on the market today. Internal check-valve included in every unit, prevents accidental pump oil backflow. Oil mist filter cap designed to capture exhaust, upgradable to our carbon exhaust filter. Large oil reservoir provides longer life, fewer oil changes required. Lightweight, with noise-dampening rubber feet. Rugged, reliable, economical, and efficient pump designed for day in, day out use. Conforms to UL 1450-4th Ed. 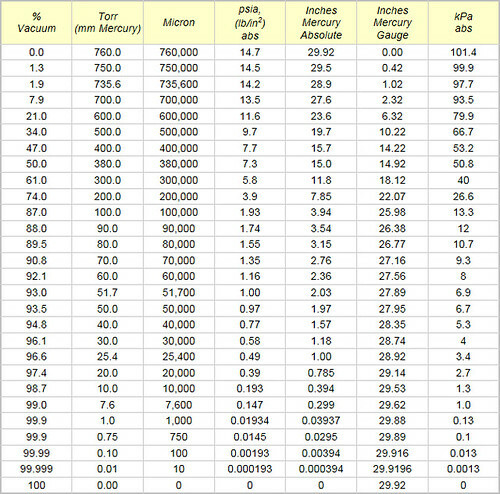 Pump speed chart for the VE225 compared against popular domestic models: CPS VP4D, Mastercool MC6-2, Mastercool MC3-2. How do Rotary Vane pumps work? For more info on rotary vane pumps please view our blog post: Rotary Vane Pumps and Gas Ballast Explained. BVV VE Series pumps are a Rotary Vane Pump style that come in either Two Stage or Single Stage. Two stage pumps have two rotors and two sets of vanes that work together to full pull a medium vacuum (1st stage) and then pull a better vacuum (2nd stage). Two stage pumps are used to pull a deeper vacuum when compared to single stage pumps. Our Best Value Vacs VE225 comes as a two stage vacuum pump to assure that an efficient deep vacuum is being pulled every time. This unit is intended for LEGAL purposes only, to be used in accordance with local laws and ordinances. Use only in well-ventilated areas! • If the consumer is using the pump for prolonged periods of time exceeding 5 minutes we require that a cold trap is used or the pump warranty is void. • These stabilization resins have the ability to break down the internal components of the pump that are plastic resulting in a seized motor voiding all warranties. • To prevent these issues from happening to your process, change the Oil after each vacuum pump use, Even if the use time is only 5min.